Where do I use my Vodafone voucher code? Enter the code at the basket page before you checkout. "If you’re a new Vodafone customer and don’t feel ready to commit yourself to a long term contract, then a pay-as-you-go SIM card may be the ideal solution for you. The SIM card is completely free and you pay for what you wish to use including phone calls, texts and data use." "To ensure you receive the best value for your money when you get your Vodafone pay-as-you-go SIM card you will need to choose the Freebie package. This allows you to make the most of your money instead of just topping up your card with cash. There are four different packages you can choose from including freebie minutes, freebie texts, freebie data and freebie international minutes. Each package will get you extra texts, minutes, data and international minutes depending on how much you top up you card with. The more you top up with, the better your freebies will be. For instance, topping up your card with £10 with the freebie text package will entitle you to £10,000 free texts and £20 can get you unlimited texts. Topping up with the maximum amount of credit will get you the best added extras. With your freebie package, you will also be rewarded with point which you can use to enjoy all sorts of extra freebies including DVD rentals, speakers, headphones, mobile phone accessories and even smartphone." "If you decide to sign up to a long term contract with Vodafone, check out their free smartphone offers available to you. By signing up to a 24 months contract and paying upwards of £20 per month for minutes, texts and data, your handset usually comes free of charge. However, if you want to be savvy, try adding up how much your contract would cost you as it may be more cost effective buying your phone out right." 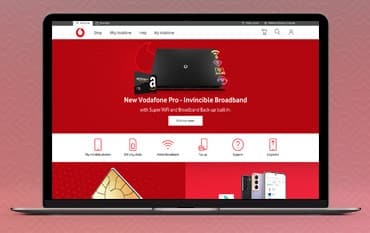 "If you want to keep up to date with all the latest news and exclusive deals that Vodafone has to offer, then like their Facebook page and follow their Twitter account. This is best way to ensure you’re kept in the know about all the best deals available. Every few weeks you will notice a social media post promoting a new sale that you dont’ want miss out on. Check the Vodafone social channels as often as you can if you want to keep up with the latest goings on." "If you think it’s about time to treat yourself to the latest smartphone, don’t just throw your old one way! By trading your old gadget in to Vodafone, you could receive a great deal of cash for your used goods. To trade in your phone, simply visit the Vodafone Trade IN page linked in the footer of the main homepage and type in the model or IMEI number to find out just how much you will receive for it. If you like what you see, package your old phone up and send it to Vodafone and you will receive your money within 24 hours of sending it." Whether you’re looking for a monthly contract or a pay as you go phone, Vodafone’s excellent national coverage means you’ll be able to make the calls you want when you want, and their customer care will be there to help you with any queries you may have while their reward scheme helps you rake in the bonuses. Stocking the very latest in handsets like the Apple iPhone 7 and the Samsung Galaxy S6, Vodafone are there to help you pick the phone and the SIM that’s right for you - and we’re here to help score you the best deals we can. 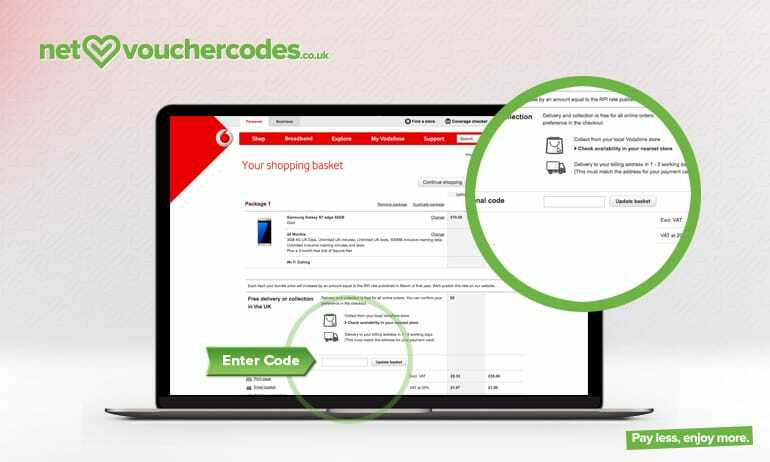 Here at NetvoucherCodes, we’ll do our best to keep you posted with any codes, offers, and deals we find. We’ll try and get you discount line rentals, pay monthly incentives, top up bonuses, savings on accessories like protective cases and memory cards, and anything else we can bring you. So check out what we’ve got right now, and keep an eye on the page for new and exclusive offers as they pop up. Get a Vodafone SIM only deal and keep the phone you love yet save on your data, calls, and texts. Choose a Pay monthly bundle and enjoy flexible upgrades, with the option to get a new phone bundle after just three months. Or, choose a Pay as you go SIM only deal for even more flexibility. You have the option to choose your bundle and the length of your agreement, with the choices varying from 30 days to 12 months. With Vodaphone you can find bundles that suit your needs, whether it's lots of data you require or just unlimited phone calls. They’re not tight on the price either with SIM only deals ranging from £9 to £37 to fit whatever budget you’re working on. If you’re looking to upgrade with Vodafone you can do so in a few easy steps. Visit the website and register an account for information and deals on your upgrade options. Existing customers can even find themselves upgrading early when they’ve been dedicated to Vodafone, as well as receiving exclusive, money saving offers on contracts, SIMs, bundles, and devices. With Vodafone rewards, you can find yourself receiving free gifts and rewards like the £10 Cinema pass that can be used in selected cinemas around the UK. You can also find yourself being gifted with other freebies that are offered to you for being a loyal Vodafone customer. You may have thought pay as you go was a thing of the past. However, many monthly contracts have us paying for features we don’t ever use. It’s for this reason that pay as you go is becoming increasingly popular again, and with the pay as you go offers from Vodafone it’s no surprise why. You can find some of the most popular smartphones and devices on pay as you go, all on Vodafone’s dependable network. Find the best deals on credit and all the latest pay as you go packages here on our Vodafone deals page. Shopping for a phone online is a great convenience for us all. However, sometimes we need that extra bit of help and communication with a real person to make a well-rounded decision about what we buy! Vodafone wants to make the buying experience as easy as possible which is why they have a team of experts working hard to bring you the best deals and valuable information in the Vodafone Store. The Vodafone store holds all makes and models of mobiles and devices that they sell, as well as guidance on the best packages, contracts and deals to go for. If you need help with your current phone or information about an upgrade simply head into the Vodafone store and get all your queries and worries resolved instantly. You can view, download and pay your monthly bill in the My Vodafone app or in your My Vodafone account. Use the SIM swap tool if you've upgraded and your new SIM doesn't fit in your new device or if it's been replaced because it's been lost or stolen. If you're using the same SIM as before just put it into your new phone, switch it on and wait for 24 hours for it to activate. How do I bring my existing number to Vodafone? First, request a PAC code from your current provider, once received complete the 'keep my number' form to switch your number over. Vodafone offers a great range of smartphones on the most competitive price plans. Snap up one of our Vodafone Promotional Codes and save on your pay as you go or pay monthly phone. With a wide range of offers on all the latest handsets like iPhone 8, Samsung S9 or the Huawei P9 you could make some great savings. They also offer a wide range of tablets that can be paid for monthly with a data allowance. Vodafone also offers great rewards and also have 3G & 4G superb UK wide network coverage and a variety of price plans to suit any budget. We are constantly on the hunt for first order Promotional Codes for Vodafone to help you with your money saving. Our experts check dozens of sites for secret codes including NHS discounts, student sites & social media channels saving you time & money!